I met Irene Cara a few years ago. Or was it just last year? She’s the kind of lady that once you met, you’ll feel like you’ve been friends since forever. She’s beautiful inside and out and I’m not saying that just because she gave me a gift during my birthday last week. Hahaha! I’m saying it because she’s like that: she’s generous in her own way and she’s really kind to her friends and most importantly to her online store’s customers… who become her friends. 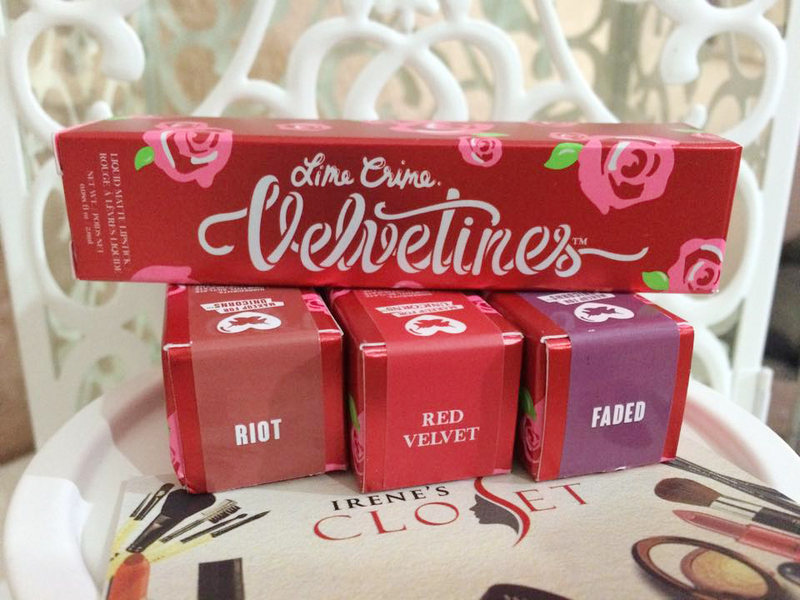 I really met Irene when I was lemming for a Lime Crime Velvetine and her Irene’s Closet online beauty store offered it at the lowest price, compared to other online beauty stores. Conveniently, she lives in the same street as mine. I am one lucky gal; I don’t have to wait for delivery! Haha! Visit Irene’s Closet Facebook page! Irene’s Closet has been in the works even before Irene and her kids decided to join her husband here in Riyadh, Saudi Arabia. 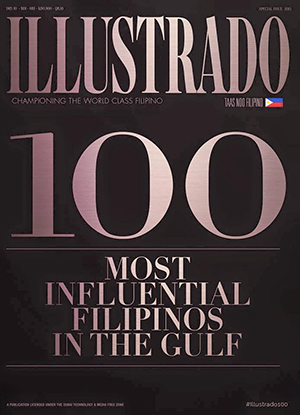 Having been a online businesswoman in her own right in the Philippines buying and selling used clothing, signature bags, and shoes since 2008, it is but natural for Irene (who has a degree in BA Business Management) to think of an online business here in Riyadh to earn extra income for her family’s needs. 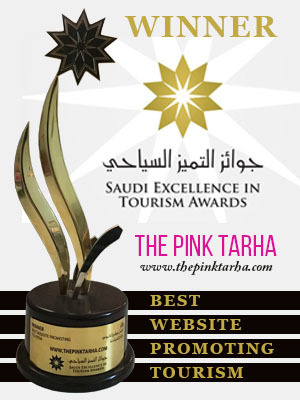 After researching on products and target market, Irene’s Closet KSA Riyadh was finally born in January, 2014. It started as a pre-order store where customers can request beauty and skincare products and it will arrive a month or so after. 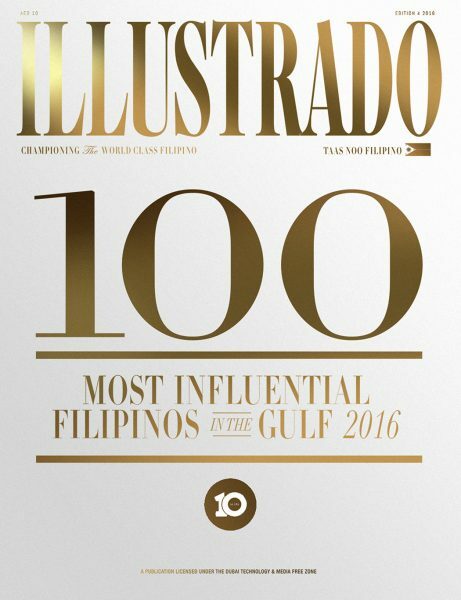 But after a year of being in business, Irene already knows what’s the best-selling products. She got to know her customers and what they like so she already has an album in her Facebook page for On-Hand items. I, for one, am always looking at this album (I try to refrain from buying but I just can’t help it! Hahaha!). 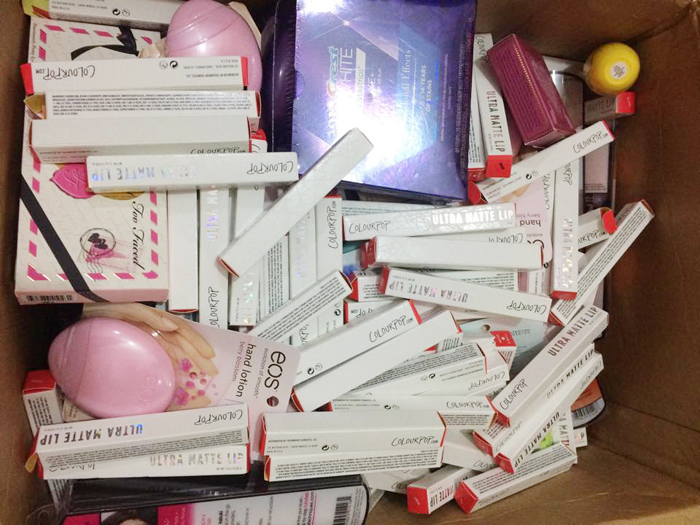 What a beauty junkie’s dreams are made of. Ready for sorting then delivery! Apart from the financial help it will bring to her family, Irene’s Closet is Irene’s way of enjoying her life in Saudi Arabia. She enjoys makeup, accessories, bags, shoes and the latest trends in fashion. She also enjoys meeting and getting to know people and gaining more friends in the community who share the same passion and enthusiasm as hers. By providing makeup-holics and fashionistas’ needs on beauty and skincare, she feels happy to be able to help them secure products that are not easily available here in Riyadh. It’s such a convenient way to shop through Irene’s Closet because they deliver in Riyadh and if you’re outside Riyadh? No problem! She sends them via a reliable courier to Jeddah, Al-Khobar, etc. I’ve been shopping at Irene’s Closet for months now and I can say that she gives the best deal among online beauty sellers, and even commercial stores here. For example, I was on the lookout for the Core Collection Brush Set of Real Technicques. One popular pharmacy carries it and their price? SR 200+ I was all set to buy it there but good thing, I waited to go home and check out the online stores here in Riyadh. 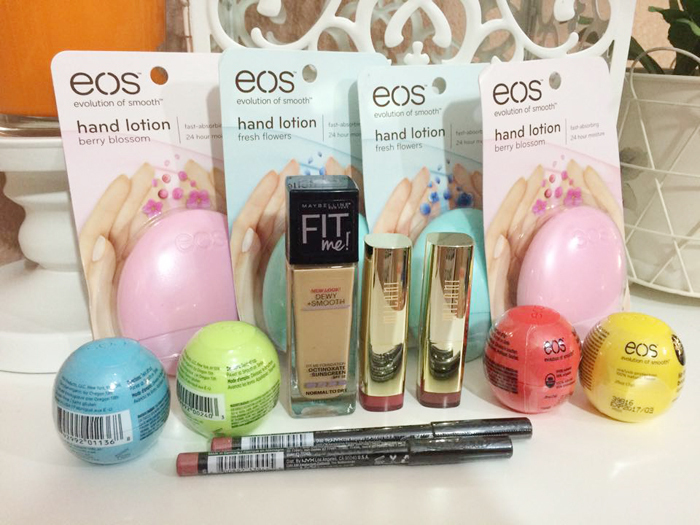 One online beauty store carry it but the price is SR 110! I looked at Irene’s on-hand items and I saw it. The price? SR 99! Do you know how much this brush set costs? Around $18 (SR 67.5) at the Real Techniques online shop. So add taxes and delivery and other costs, it wouldn’t have to go over SR 100 right? 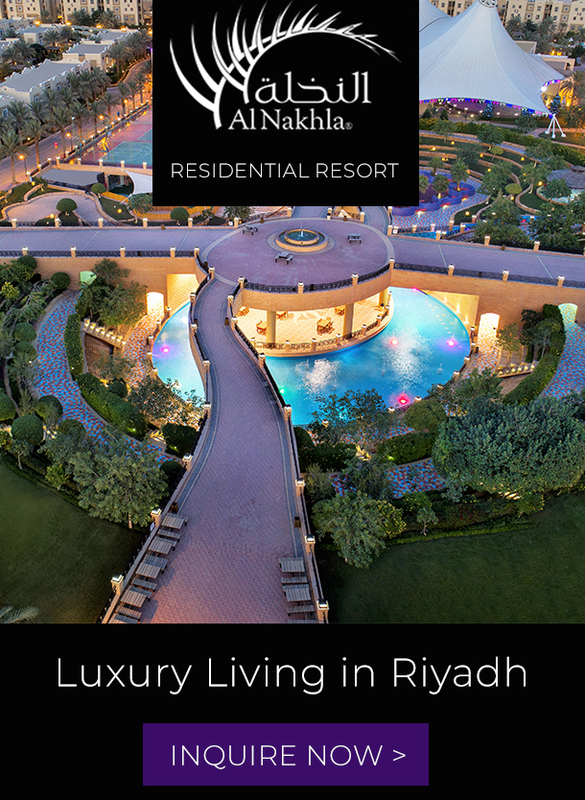 Just imagine how much riyals I have saved by buying it from Irene. It’s the fairer deal. 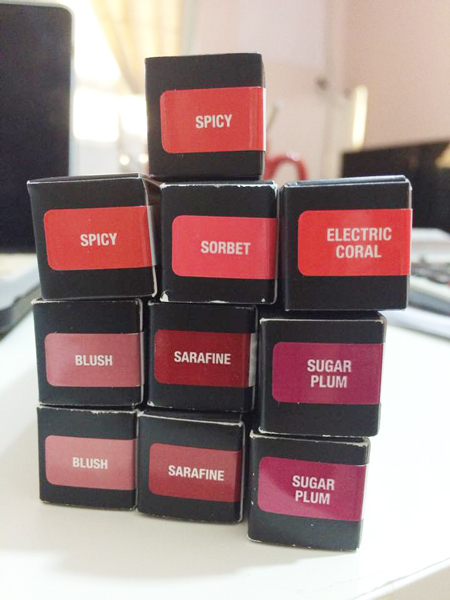 Her MAC lipsticks, which are personal favorites, cost around SR 95 while at the local stores, they’re at SR 110 a pop. If you’re willing to wait, and save some riyals in waiting, I highly recommend Irene’s Closet. Her bestsellers include Anastasia Beverly Hills, Urban Decay, Lime Crime, Milani, Tarte, Makeup Geeks, Colourpop, and more. Her personal favorite beauty product is Anastasia Beverly Hill’s Brow Pomade (holy grail material!). A cult favorite. 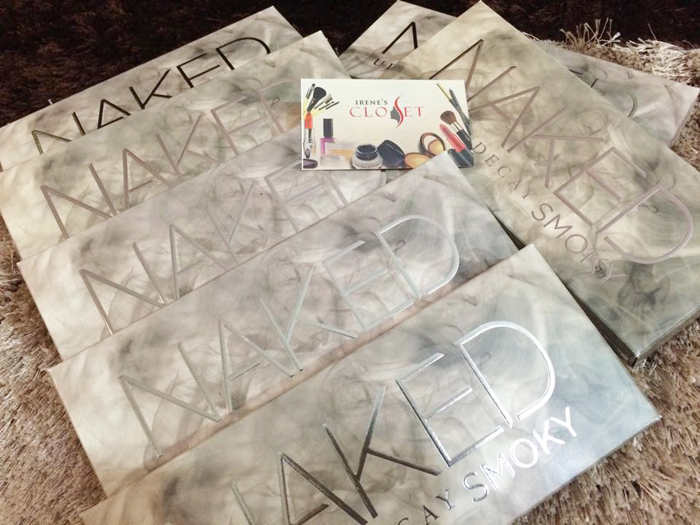 I’ve been wishing for the Naked 3 since uhmn forever! Nyx Soft Matte Lip Cream are always available. Faves: Anastasia Beverly Hills Liquid Lipstick. A customer’s order. As random as you can get and Irene will bring them for you. 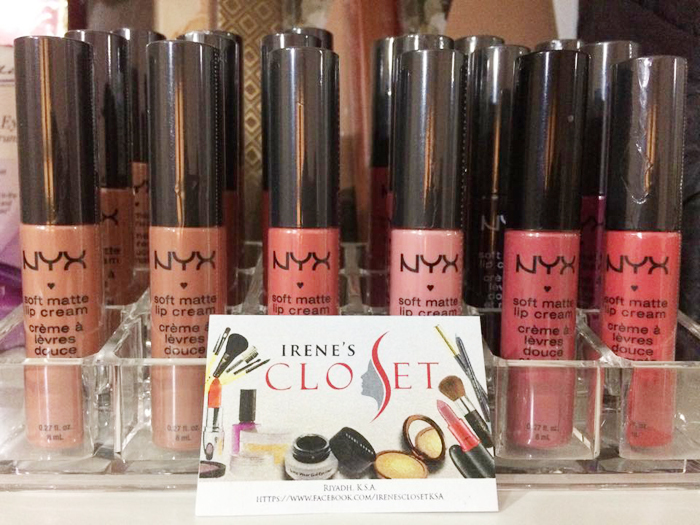 I bought a lot of items from Irene over the past few months and my personal favorites include Ben Nye Finishing Powder, Milani Blush in Luminoso, Colourpop Ultra Matte Lip, and Lime Crime Lipstick. My reviews on some of them have landed in our Beauty Bets section. Wait for more! Haha! Unlike commercial websites run by a lot of people just doing their day job, you will get to know the woman behind Irene’s Closet when you order. Added bonus is the tips and tricks that she can give you in makeup application, the best color for your skin tone, the proper way to use a particular brush, etc. And also the personalization and freebies that she includes in her pretty paper bags. It’s like being a part of a small community of like-minded individuals when you go to her Facebook page. She also inspires other housewives with this endeavor. Just because you’re stuck in the house for the day with your husband and kids away for work and school… you can’t do anything that will occupy your time and earn money. All you need is patience, love for what you do, and faith in yourself. I actually like Irene’s “job”. She’s surrounded with pretty stuff all day long! But if I am on her shoes, I can’t probably help myself from trying every thing! Haha! PS. 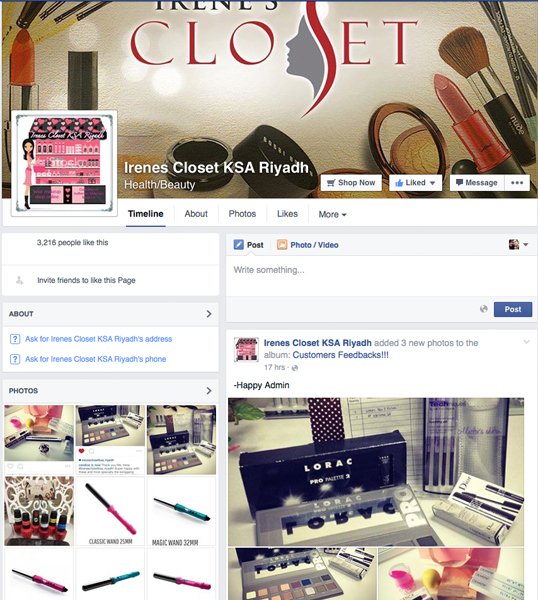 All photos in this entry are from Irene’s Closet KSA Riyadh Facebook page.